I must admit that coming to China I had formed some preconceptions, though unfounded, they still made their way into my mind. The most prominent and most embarrassingly stereotypical was luckily the first to be challenged, almost immediately, through my Shanghai experiences. The notion centered on the idea of control. China due to its communist past, and the still centralized government’s reputation, I imagined the population to appear slightly repressed upon arrival. My first journey into the city dismantled this view and replaced it with the opposite impression. The lack of control is most striking; the urban citizen is allowed to operate with a high level of autonomy, using the street as a truly public realm. From street vendors clustering around subway exits to temporal wet markets, the Chinese street has led me to question what constitutes freedom within the urban realm. The level of public access that the Chinese urbanites have in the utilization of their streetscape is amplified by the juxtaposition of my past experiences. The United States, of course, is the counter pole of this activity but even the Japanese street wanes in comparison to the activity of China. The key difference between China and the other two nations seems intrinsically tied to levels of development. As a nation develops the occurrences that have made China so immensely interesting on this trip tend to disappear, the street becomes regulated, excluding uncontrolled activities. This trajectory of development seems to allude to a contradictory process: that as the city modernizes, moves toward a service economy, it becomes less free. Its inhabitants become more restricted, choice is diminished, regulation is imposed and enforced. Yet if one continues to compare and contrast say a city like Shanghai and Tokyo, it becomes apparent that freedom does not have a singular definition within the city but is something much more complex. In Tokyo the population has given up a large amount of individual freedom and expression for the freedom of the larger whole. The immense conformity of the population, has allowed for an amazingly efficient, economically driven society to develop. But with the sacrifice in self-expression comes many benefits; most people can afford the consumerist lifestyle that drives society. Additionally the city is made democratic by the clockwork efficiency of its transportation system, creating a physically accessible city. 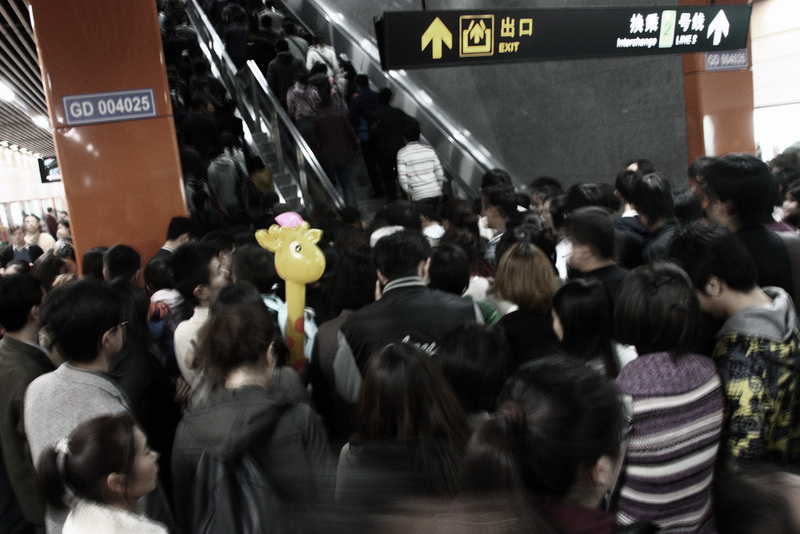 China’s current urban freedom, amplifies the opportunities of the individual. As a result of rapid urbanization the population must be given a large level of autonomy else the city would cease to function. The wealth distribution is too unequal to force the entire population to attain their goods and services from large, commercialized, global brands. The question now is how will freedom be defined as the Chinese city continues to develop. Given the statements of Third Plenary Session of the 18th Central Committee concerning “human-centered-urbanization” and a “rebalancing of the economy,” the future is somewhat uncertain. Though human-centered-urbanization sounds as though it should support the microeconomic activity of the individual the rebalancing of the economy focuses on the need for the population to become more consumerist centric; therefore it could be argued that the Chinese government’s definition of freedom is that to consume. Yet it is more than just general consumption, for that occurs already , microeconomic activities are of course tied to consumptive needs, yet I believe consumptive centric development focuses of the creation of consumptive desires rather than only needs. 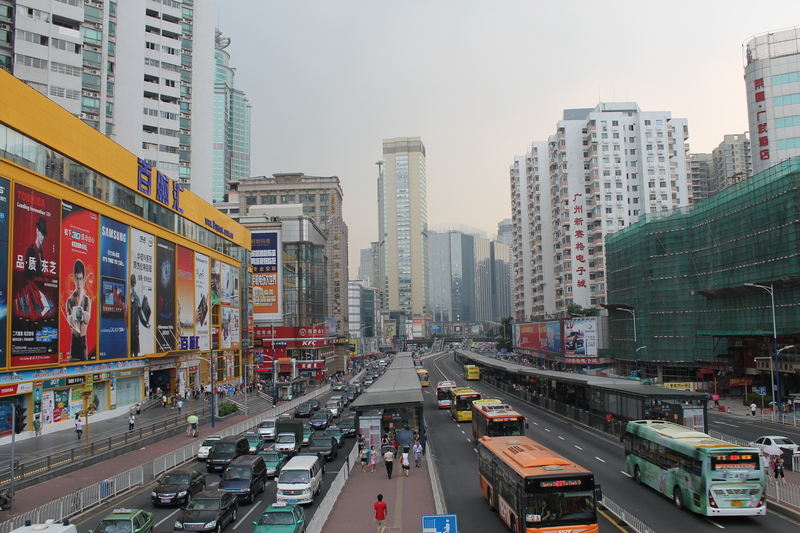 While Los Angeles was spending over one billion U.S. dollars this summer to add a lane to the already impossibly congested 405 freeway, the people of Guangzhou were enjoying their brand new Bus Rapid Transit system (BRT). The system, which includes 22.5 kilometers of segregated bus lanes, 26 stations, and 40 bus routes which enter and leave the BRT corridor (which runs along Zhongshan Avenue, see section through street), has only been open since 2010 and already services over eighty thousand riders at each station per day. In just one year, people have embraced the BRT wholeheartedly, and by choosing it over cars or taxis they are thus helping to improve overall traffic speed and flow. Moreover, what is merely the icing on the cake is that the system has helped eliminate fifty thousand tons of CO2 emissions in its first year due to fewer bus kilometers driven. four, which is perhaps the most innovative component of the BRT, is the bike share component. Every BRT bus stop neighbors a bike station filled with recognizable orange bicycles (to match the busses, of course) where riders holding a transit pass can check out a bike which is free for the first hour, then only ¥2 ($.31) for each additional hour. The idea behind this is that the system can branch into areas of the city (i.e. the urban villages) that public transit could not previously access. In the future, these electronically-monitored ‘satellite’ stations will be installed deep within the villages, so that migrant workers can get off the bus, ride a bike home, and then ride one back to the bus the following day. In one example after another, it is proven that not only is the BRT beautifully engineered for expediency and efficiency, but that it also provides mobility for the populace, not the rich. By collecting and incorporating the existing city lines into the BRT, the existing system had to change very little, which was both civically cost effective and socially sensitive in that it did not upset the routines of the regular users. And, although car users are said to dislike it, the traffic congestion in the car lanes does not seem to have changed much since the segregated bus lanes were introduced. Moreover, at a cost of only ¥3 ($.47) per journey no matter how far one is travelling, these lower class migrant workers who reside within the aforementioned villages truly can afford to utilize the BRT. Pregnant Woman or Road Obstruction? The injection of anabolic steroids artificially creates an internal bodily environment that dangerously over-exhausts resources to the point where the physical body starts to deteriorate. In the confines of the human body where resources are finite in both quantity and capacity to perform, the major organs such as the kidney take on fatal damage. When the Chinese government injected its designated cities with its own performance-enhancing drugs, vast stretches of vertical architecture popped up like bulging muscles on a human body at inhuman speeds, interconnected by veins that made up a complex network of urban transportation. But unlike the human body, China seems to be flourishing, economically speaking, without deteriorating. It thrives not only at larger scales of big businesses but at the microscopic level of the man who runs an obscure one-hundred-square-foot snack shop in an obscure alley several blocks away from a major street (something that would never work in less dense, horizontal cities like Los Angeles). The sheer density and quantity of its resources argues that China was actually in dire need of this artificial injection of economic juice. In cities like Shenzhen, however, significant damage occurs at the social level where the individual seemingly tolerates collective co-existence but in his fundamental actions and mindset displays what at first seems to be a lack of “respect” for other individuals. But is it really a lack of respect or am I just seeing it that way as a westerner accustomed to my pedestrian right of way. I witnessed a pregnant women trying to cross a small street at a green light, having to stop and retreat backwards several times because the oncoming cars would obnoxiously honk their horns and refuse to stop. In order to maintain such a high level of economic efficiency and intensity, a few seconds of pedestrian priority become a luxury that that collective cannot afford. 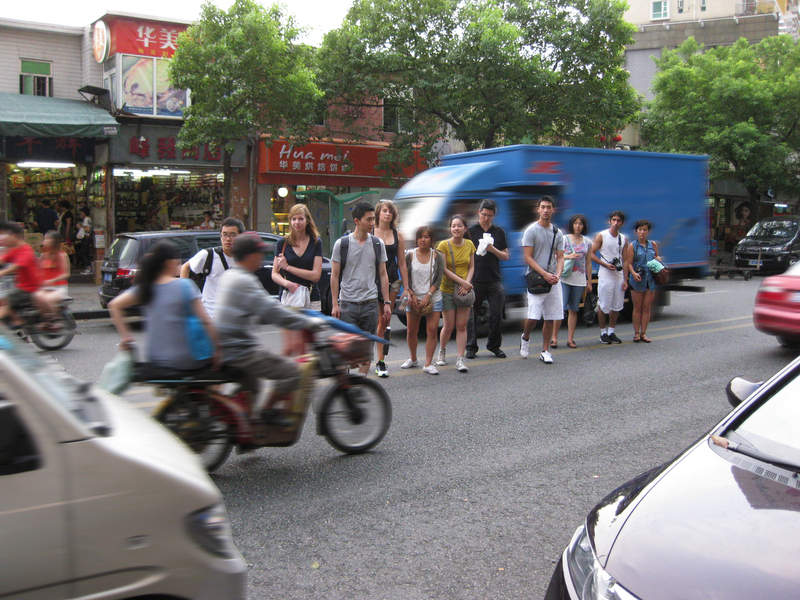 The density of both the people and the built environment does not necessarily equate to an increased awareness and respect for the quality of other’s lives but rather, as Simmel argues, leads to a desensitization of the people brushing and driving past you. What surprises me most about the pregnant woman is her reaction to the cars honking and driving past her. She is perfectly tolerant. In fact, she doesn’t even “react at all… An incapacity emerges to react to sensations with the appropriate energy.” Simmel notes that the “metropolitan child” develops a “blasé attitude” by which they are not merely tolerant of these situations, but they just simply have no reaction of any kind. It is an accepted way of life. Just as Americans don’t respond to the presence of clean, drinkable tap water at restaurants. The pregnant woman doesn’t raise her hand in fury and confidently demand her right of way as would happen in the States. But rather, she tries to weave through the incoming cars and dangerously make her way through them, while holding up her belly. In the States, such a sight would be so ridiculous that it would be comedic to watch. At the same time, when pedestrians try to cross at a red light, the oncoming drivers are not honking in anger, demanding their right of way, and rolling down their windows to curse and flip off the pedestrians. Rather, they honk and weave through traffic with the same face of reaction-less tolerance. Is the significance of human life diminished to a dispensable commodity that requires this kind of fast-paced, machine-like social mindset in order to survive? It seems from the actions and expressions of the people that it is not so much that the importance and quality of human life is diminished but more that the importance of economic efficiency is amplified to the point that certain social sacrifices must be made. At the end of the day, the pregnant woman makes her way across the street and carries out the rest of her day, probably running through dozens more cars on her way back home. Ants move across the ground one after another, using scent to follow each other’s exact footsteps. When multiple ant trails are present and begin to intersect, the negative space between these pathways becomes defined. From an overhead view, these intersecting trails begin to appear as the streets in a figure field view of a city plan. These walkers carve out space as they circulate through the city, similar to the movement pattern of ants. The tracks created by people’s walking patterns form barriers around mental objects. These mental pathways do in fact produce physical space. The void between the barriers becomes an object being contained by people. This metaphysical object becomes an obstacle not to be touched. Walkers produce a mental space rather than a physical one. Yet, this space is at the same time a tangible, visible space, which inherently becomes physical. Japan’s model of creating contained voids through walking patterns is almost an exact replica of an ant’s trail. People follow one another in a set line. Virtually nobody steps out of line, or causes any sort of disturbance to this route. How are these routes determined? And by whom? It is almost as if the people of Japan are robots, following somebody’s master plan. While the pathways of walking in Japan may be similar to the scrupulous organization of an ant trail, China lacks this control. In China, there are no apparent nor visible routes which walkers automatically fall into. The voids carved out by an ant’s trail become polluted. People, either moving or stagnant begin to dot these previous desolate spaces. These pedestrians move in an unorganized manner, sometimes against the flow of traffic, and sometimes come to a complete stop for no apparent reason. Even when there is an organized line, with barriers, where people are meant to queue, in China people attempt to push ahead. Instead of a single-file line, three or four people are standing side by side trying to get ahead. These attempts at pushing forward simply put pedestrians a whole behind due to a lack of efficiency. Can the pedestrians of China be considered walkers? Or merely just people who are moving? Although the well-defined void spaces created by Japan’s walking patterns may appear to be wasted space, Japan’s pedestrian traffic flow is much more efficient than that of China. China’s polluted void space and undefined pathways create almost a completely chaotic atmosphere. This polluted disorganization creates an atmosphere where true walkers cannot exist.